After three weeks its a two horse race in Wales. Cardiff Blues remain on top in the Welsh regional – but champions Ospreys are in great form, with a game in hand. The Welsh Regional Championship is a five team tournament, so each week one team sits out. Both Cardiff Blues and the Ospreys are unbeaten, but Cardiff sit on top having played one more game. And the crucial decider is next weekend. Last weekend both games were played back-to-back in Swansea. The Ospreys played first against Scarlets, and ran out comfortable winners with tries from Lauren Smyth, Alecs Donovan, Keira Bevan, Kelsey Jones and two from Ffion Bowen gave the Ospreys a second bonus point win. Ospreys dominated the early stages of the game but it wasn’t until the twentieth minute that they managed to drive their way into the Scarlets half and double the pressure on their opponents. Building up the phases, a quick passage of play set up Lauren Smyth for the opening try for the Ospreys. No conversion kept the score 5-0. Scarlets quickly replyed when a clearance kick in the Ospreys 22 was charged down for them their first try of the game. 10-5 was the score and so it remains to halftime. A break from Kerin Lake out wide early in the second half saw the captain make good ground, before offloading to Alecs Donovan, who went on to score. 15-5 with just two minutes of the half played. A Jodie Evans penalty pulled Scarlets back to 15-8 but the Ospreys came back quickly, good support from the pack sending Ffion Bowen to crash over the line , Keira Bevan adding the extras. The Scarlets were soon pinned way back into their 22 once again, and a show and go from Bevan saw her under the posts for Ospreys fifth try. Converting her own try took the score to 29-8. Shortly afterwards a forceful driving maul from the pack set up Kelsey Jones for the Ospreys sixth and final try of the game which ended with a 34-8 win for the champions. Challengers Cardiff Blues were up next against RGC from North Wales. A Robyn Wilkins try quickly put them on the scoreboard, but RGC showed the form that gave them second place in their first season last year, good offloading leading to a score in the former, and the North Walians were 5-3 ahead. Midway through the half Blues were back ahead with tries from Rafiuke Taylor and Molly Philpott, but the drama was far from over. RGC replied with two quick tries of their own to regain the lead, only for Manon Jones to end a dramatic half with a third Blues try and a narrow 20-17 halftime lead. 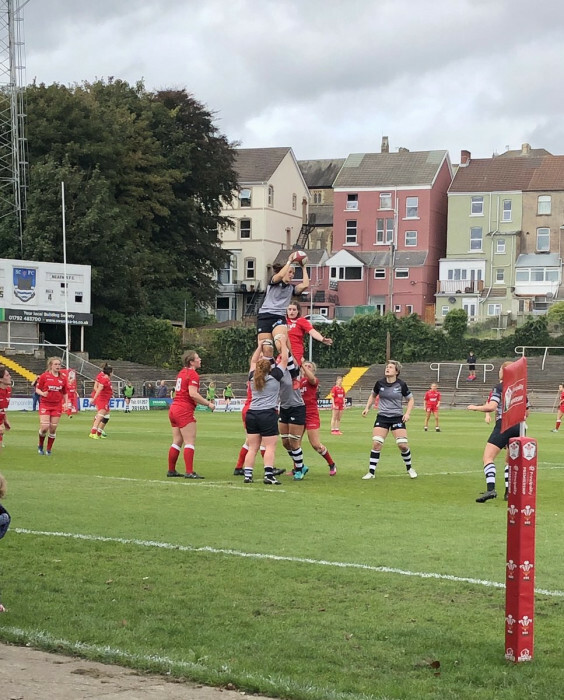 The tension released a little for the Blues with two more Rafiuke Taylor tries – her second hat-trick in two weeks – extending the lead to 30-17, but Beth Davies for RGC pulled her team back again. Into the final quarter Rafiuke Taylor added her fourth try, but again RGC responded leading to a tense final ten minutes, with Blues coming out winners 35-27.